Despite considerable evidence to the contrary, some critics have questioned whether Lee Harvey Oswald really owned the revolver used to shoot Officer J.D. Tippit. Recently, allegations have been made based on a 1974 unpublished manuscript by Fred T. Newcomb and Perry Adams titled, Murder From Within. 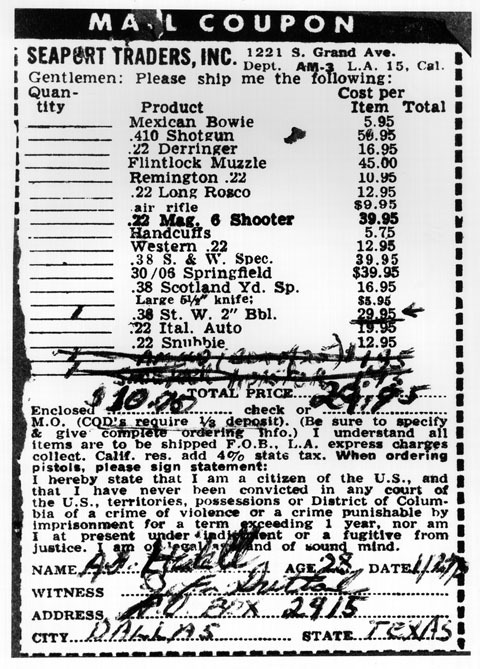 According to Newcomb and Adams, a 1964 Senate Judiciary Subcommittee looking into mail-order firearms trafficking published a chart which showed that Seaport Traders, the firm Oswald ordered his .38 caliber Smith and Wesson revolver from, never shipped any .38 revolvers to Dallas, Texas in March 1963 - the month of Oswald's order. Newcomb and Adams concluded that "Oswald's gun, in effect, did not exist." Although critics have clung to Newcomb and Adams' assertions as proof positive of forged documents, cover-ups, and the alleged framing of Oswald, little has been done to substantiate Newcomb and Adams’ claims. In fact, a review of the record shows Newcomb and Adam's allegations to be false and misleading. Was Oswald a Dodd Committee Investigator? Newcomb/Adams' claim that Oswald's role as an investigator "went further than merely placing orders." According to the unpublished manuscript, "if Oswald could engage in visible and provocative activities and still buy mail-order guns, then the Dodd Committee could use this record" during their hearings. Newcomb/Adams' proceed to list Oswald's "provocative activities." They paint a picture of a young "investigator" pouring through and clipping out mail-order gun coupons, while getting involved in various pro-Castro activities. Yet, all of the "provocative" activities cited by Newcomb/Adams took place after Oswald ordered the weapons. The Dodd Committee, on the other hand, was clearly interested in mail-order guns that had been sold to persons who already possessed a criminal record or were under age. Considering the record, Newcomb/Adams' claim that Oswald's activities fit the profile of one of the Dodd Committee's investigators is unquestionably false. The Gun That Did Not Exist? Next, Newcomb/Adams shift focus to Oswald's possession of a .38 caliber Smith & Wesson revolver at the time of his arrest. They cite the Dodd Committee hearings and claim that a chart based on ATF-prepared Seaport Trader records, shows that the gun dealer "did not ship a .38 Smith and Wesson revolver to Dallas in 1963." The chart, Dodd Committee Exhibit 28, is reproduced in the manuscript to underscore the claim. This oft-cited passage has been used as the cornerstone of critical claims that the revolver attributed to Oswald was a "plant," dropped into Oswald's hand at the Texas Theater (or switched with Oswald's "real" gun), and that the paper trail later presented was fabricated to frame Oswald. Yet the record - and Newcomb/Adams' own manuscript - shows that Exhibit 28 was based on an incomplete record. All of this information was noted by Newcomb/Adams in their manuscript, including a copy of the chart. Yet, Newcomb/Adams concluded that since the "chart shows Seaport did not ship a .38 Smith & Wesson revolver to Dallas in 1963," that "Oswald's gun, in effect, did not exist." Such a conclusion is, of course, inconsistent with the facts. The chart prepared for the Dodd Committee was based on an incomplete record supplied by Seaport Traders. This fact is discussed throughout Rose's testimony and was duly noted by Newcomb/Adams. 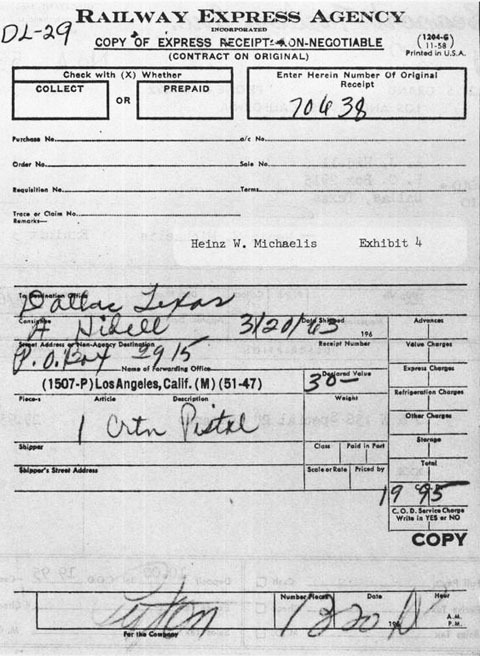 How then can Newcomb/Adams substantiate their claim that no .38 Smith & Wesson revolver was shipped to Dallas in 1963? The contradiction seems to have escaped the pair of researchers, as well as their critical supporters. The fact that Seaport Traders did not turn over to the Dodd Committee a record of the revolver shipment to Oswald was no doubt due to one simple fact: the FBI had taken possession of the documents nearly four months prior to the committee's questioning of Seaport Trader owner, George W. Rose. 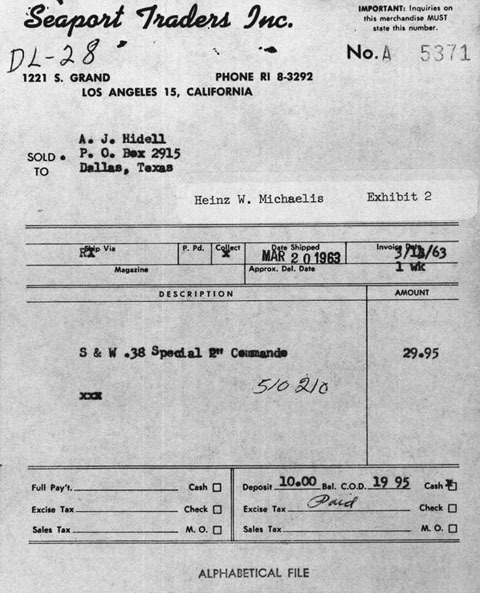 Los Angeles based FBI agents searched the records of George Rose & Company, Inc. on Saturday, November 30, 1963  and located the original purchase and shipping records relating to the V510210 revolver, including the mail-order coupon filled out by Oswald. These records were confiscated and sent to the Dallas FBI office the same day. George Rose, owner of Seaport Traders, was subpoenaed by the Dodd Committee on March 2, 1964. At the same time, the Dodd Committee requested true copies of all records pertaining to the years 1961, 1962, and 1963. Two weeks before Rose's April 24th appearance, the committee had still not received the records they had subpoenaed. A week later, ATU agents went to the George Rose & Company premises and pieced together the list which was eventually entered as evidence. This list proved to be an incomplete record of the items requested. Regardless of the state of Seaport Traders' records, the Oswald order could not have been part of those submitted to the Dodd Committee because records for the Oswald order had already been turned over to the FBI. Texas law states that one who wishes to purchase a pistol or handgun must first obtain from a justice of the peace, county judge, or district judge of the county of his residence a certificate of good character. Although REA Express would withhold shipments to consignees who failed to display a license or permit in states requiring same, REA regulations do not specifically address whether a shipment would be withheld if a certificate of good character was not presented. Hendon did testify that REA Express "has approximately 32,000 of its own employees, with individuals retiring or leaving the service each day, being replaced by new employees...It would be practically impossible to exercise such close control over and communication with all of our delivery employees to keep within the requirements of the law..."  Undoubtedly, there is no way of knowing how many packages containing firearms were delivered without a strict adherence to the law of any particular state. Rule 255: Employees must use their best judgment in respect to identification and unless fully convinced of the claimants' identity, must decline to make delivery and should report the circumstance to a superior or agent. The utmost courtesy must at all times be observed in requiring identification. Rule 257: If consignee is an entire stranger and is unable to obtain personal identification, he must furnish evidence that the shipment was sent to him - first, by correctly describing the contents thereof before shipment is opened, which must be done in the presence of employee effecting delivery; and, second, by surrendering shipping receipt, if in consignee's possession. If employee still has any doubt as to the party being the proper consignee, the goods must be held and agent notified. Letters, postal cards, or bank books should not be accepted as positive identification. Oswald could meet Rule 255 by simply showing the false picture identification card in the name of A.J. 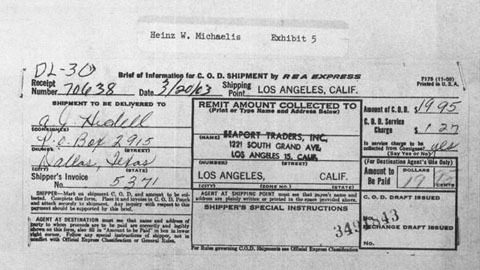 Hidell - which he had in his possession at the time of his arrest, or meet Rule 257 by describing the contents of the package. Either way, he could take delivery of the revolver, without signing anything. In the end, Newcomb and Adams' suggestion that Oswald was working for the Dodd Committee is false and unsupported by the events they cite. Their claim that Seaport Trader records show that no .38 Smith & Wesson revolvers were shipped to Dallas in 1963 ignores the fact that records of the Oswald transaction were already in the hands of the FBI at the time of the Dodd Committee Hearings. Finally, contrary to their manuscript, there is a substantial paper trail that connects Oswald to the pistol ordered from Seaport Traders. Oswald ordered the .38 Smith and Wesson revolver under an assumed name (A.J. Hidell) using a mail-order coupon. The coupon was dated "1/27," no year. The coupon and a $10.00 deposit was received by Seaport Traders on March 13, 1963. The order was filled by Emma Vaughan and shipped March 20, 1963. The package sent contained a modified .38 Smith & Wesson revolver, serial number V510210. Once Oswald received the notification card at his P.O. Box, he simply took a bus back to the REA Express office - presented the notification card, the balance due, and some form of identification - and accepted delivery of the revolver. The paper trail created by Oswald's purchase of the .38 Smith & Wesson revolver under the name A.J. Hidell is clear and direct. The actions taken by Seaport Traders and REA Express in response to Oswald's order are consistent with each company’s rules and regulations at the time and serve as evidence that the order was processed and delivered as described. The fact that the revolver shipped to Oswald's P.O. Box was in his possession at the time of his arrest is further evidence that the transaction occurred as demonstrated. In conclusion, there can be no doubt that Oswald ordered and later took possession of the V510210 revolver. Do you have any idea where this gun is today? I test fired it in l963 and have 2 test fired slugs fired into wet cotton from it. I have kept then in storage for years just as a keepsake but the more I read the more interesting it gets. Interested in Illinois will be my title if we correspond. The revolver is in storage at the National Archives. Some years ago I recall learning that a new law went into effect in early 1963 requiring that a form be filled out by a person purchasing a weapon through the mail, and a one dollar fee be charged. I was able to obtain an article on the new law, which appeared in a national magazine (LIFE or SAT. EVE. POST perhaps), which I no longer have. I'd like to pose a question that subscribes to common sense more than here say. Some of use believe Oswald was working for the FBI while he was living in Dallas and working at the printing company. There has been much testimony that talked about seeing Lee accepting envelopes from a man in a govt. car, while at the car repair garage next to the printing co. We also know about his association with FBI agent James Hosty. It's my belief the FBI was using him to pose as a perspective gun buyer and purchase firearms through the mail. We know the FBI was investigating this practice and after Johnson was in the White House, he signed leglishlation to outlaw the ability to buy guns through the mail. I think the FBI was using Oswald as a "field agent" to demonstrate how easy it was to buy guns via mail. The reason I believe this is that IF he wanted to buy a rifle to be used to murder someone he would have purchased one that he was familiar with. In the Marine Corp Oswald had much experience with an M1. Question: Why didn't Oswald buy a gun he had experience using, and one that ammunition was readily available? Instead, he bought a cheap, unknown weapon, and it takes ammunition that could only be purchased from only 2 stores in the Dallas/Ft.Worth area? He could have bought ANY gun for many sporting goods stores and had to show any identification. Yes, he used a fake name with the MC, but he still have to give a proper mailing address. To be completely annonomous he never would have used the mail order system. I believe he bought the Manlichler as an "assignment" for the FBI, and had no plans to kill the president. Much of what you've written as "fact" is not true. To cut to heart of your question: Why did Oswald buy the Mannlicher-Carcano vs an M1? Ans: The MC was less expensive. (Reminder: Oswald worked menial jobs when he worked at all.) The article above shows the fallacy of the "Oswald as mail-order investigator" argument. Finally, don't forget that common sense is incredibly uncommon. OK just for my benefit. Why is the gun not new. How can the store sell an old beat up used gun by mail order. Also where is the proof that this old 38 was used to kill Tippit. Wouldnt it have been easy to establish that the gun had been fired that very day that Oswald was arrested with it. The revolver was WWII surplus - not "an old beat up used gun," as you put it. 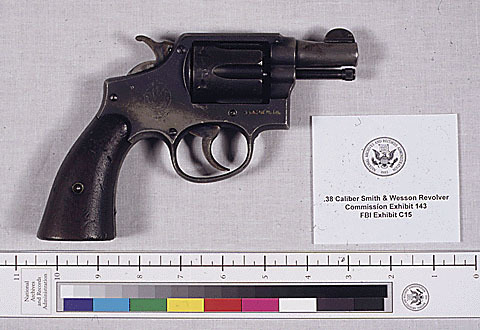 The proof that the revolver Oswald admitted to be carrying at the time of his arrest and which was taken from his hand by arresting officers (one of which he tried to shoot) was used to kill J.D. Tippit is too numerous to detail here. See: With Malice: Lee Harvey Oswald and the Murder of Officer J.D. Tippit.